The Times Picture Annual 2016 surveys the quest to chronicle events that took place mostly in Malta during a given period of time. The photographers featured in this illustrated annual were assigned to record specific events and situations which either fall into the yearly routine of events and rituals such as the national budget presentation, village feasts, summertime concerts or festivals, sports events, tragic events that always seem to make the front pages and events of international status, such as a Heads of State meeting. In previous reviews (2011-2015) I dealt with issues of photojournalism from its origins to the present digital era. In this review I concentrate more on the photographs themselves and try to read the content that lies underneath their glossy surface. These are images that first appeared supported by texts, giving a fuller record of how they shape the view of our world and are now being reproduced in a different context. Detached, isolated and random, they become an assortment of images that converge in a single package of printed pages. They now lay bare and together compete to succeed as images symbolic of time and space. Irrespective of provenance, they are given space in our stored visual recollections so that the photograph succeeds most of all when we remember it. Photography is truly successful when it fulfills this purpose, whether the image is destined for the newspaper, gallery, magazine or monograph. This investigation always conjures in my mind photography’s most impassioned advocate, John Szarkowski. His seminal writings and landmark exhibitions at the Museum of Modern Art (Moma), as director of photography for more than three decades in New York, changed the perception of photography, then commonly perceived as a utilitarian medium, to that form of expression as meaningful as a work of art. I will go through a selection of some of the photographs which represent all the five photographers featured in this annual and read the content of these pictures from this perspective, starting from Queen Elizabeth’s picture (page 9)... a personality with a magnetic aura which attracts press photographers like honey to a bee. 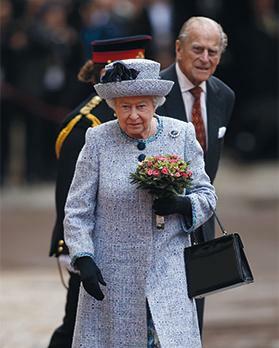 Queen Elizabeth is seen in this picture taken by Darrin Zammit Lupi arriving at San Anton Place together with Prince Philip at the start of a State visit to Malta. The photograph, composed in a portrait fashion, also exercises the use of selective focusing, so that your eye is drawn immediately on the Queen with the brighter colours and is in sharp focus in contrast with the soft and low key background. The photographer captures a glimmer in her face as she walks steadily ahead under the watchful eye of Prince Philip... perhaps she is recollecting her the happy memories during her stay in Malta as a young married wife. The photograph augurs well as an addition to the portrait gallery of QEII. Three men are caught gesturing in a photo-graph by Matthew Mirabelli on page 24. 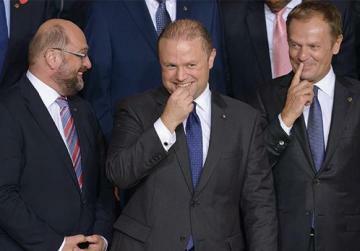 The photographer’s quick reaction in acknowledging the decisive moment of three high profile EU leaders as they sneer during a group photo session, makes this picture fun to look at. The gestures of the two standing gentlemen facing the camera says it all, and one does not need to go through a catalogue by Desmond Morris to reveal the meaning of the human actions, postures, gestures, facial expressions and clothing which abound in this photograph. Darrin Zammit Lupi gives us a totally different and striking photograph on page 98, which captures the setting sun behind a very surreal and silhouetted cityscape. 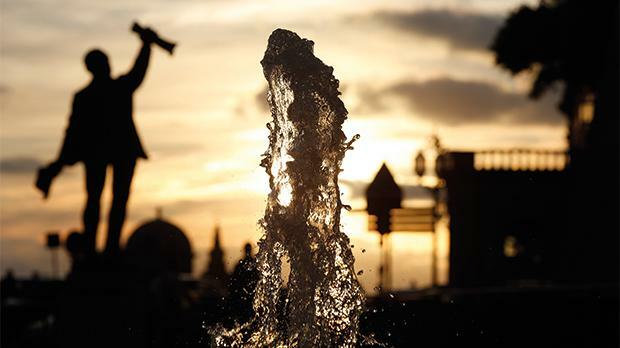 This is a very unusual representation of Castille Square with the mercurial effect of spouting water from a fountain dividing the picture into symmetrical parts filled with soft silhouetted shapes of statues, church domes and other architectural features resembling metaphysical art. This is one of the most rare types of photojournalism pictures that evokes an empathetic response from viewers because of its surreal content. The photograph demands a certain amount of time for legibility as our cognitive processes begin to decipher the image. Even after a period of viewing time, we are still searching for the gestalt in the picture, because there seems to be no point of reference. Is it a silhouette of a charging figure? A column of water? A classic dome? A delightful picture is presented on page 107 by Chris Sant Founier with a woman seemingly trying to waltz with a man who turns out to be a representation of Christ the King in papier-mâché form. They are both frozen in the picture, so that the immediate reading of the picture tends to reveal two human beings confronting each other and only as time elapses do we realise that one of them is actually a well-crafted and painted life-like sculpture. The women’s touch evokes Michelangelo’s painting of the Creation of Adam in the Sistine Chapel and, as the caption implies, the statue becomes incarnate as the women seeks to receive a divine blessing. This photograph is rife with anthropological content and the village festa is a minefield for this type of photography. 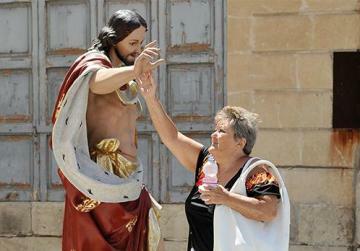 Another photograph related to the Maltese village festa is the one by Mark Zammit Cordina on page 112. 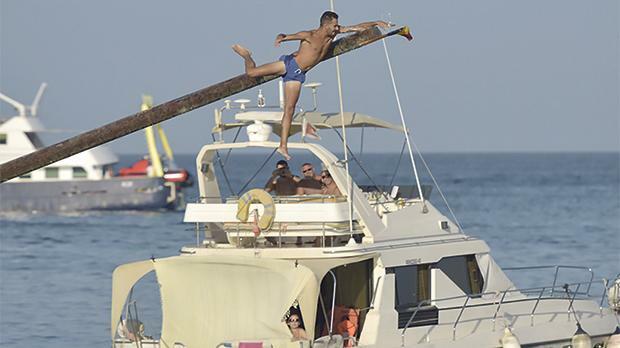 Emblematic of the Cartier-Bresson style of candid photography, the picture – with its foreshortening quality due to the angle of vision of the camera – creates an interesting juxtaposition of the audience in a luxury boat viewing a local contestant at the point of reaching for the flag. The dramatic airborne poise of the contestant with outstretched arms and legs and muscular tension at the point of successfully grabbing the prize, makes the picture vibrate with energy but leaves us guessing as to what happened next. The caption then projects the picture into the next moment to inform us of his success. Steve Zammit Lupi gives us a very interesting and thought-provoking picture on page 132. This young and promising photographer has the ability to select and isolate the protagonists in this photograph in a very busy bus terminus in our capital city. In so doing, the picture with a woman covering her eyes (possibly aware of her picture being taken) is suddenly charged with a different meaning. 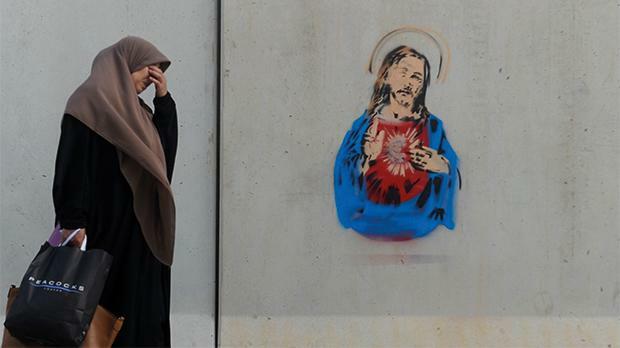 She becomes a contemporary Mater Dolorosa as she is captured next to the stenciled image of Jesus Christ. The commercial brands printed on the bags and the euro currency sign over the ‘Heart of Jesus’ reflect the tension between various religious societies now grappling with secularism.